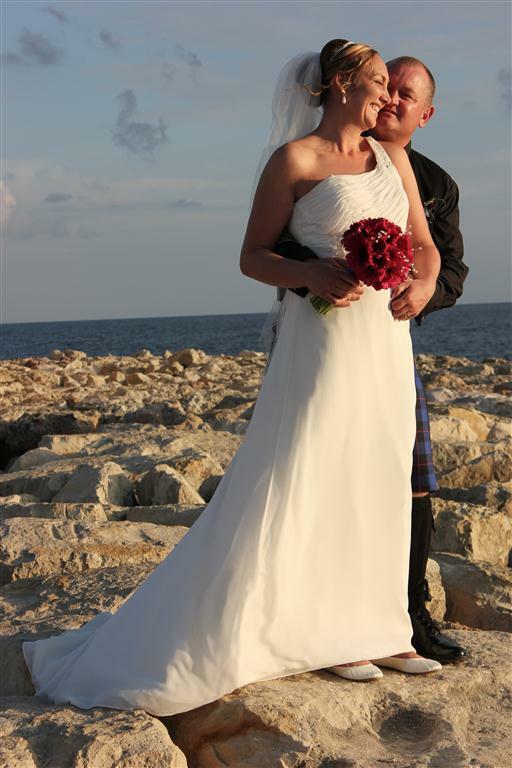 Janis & Ian were married on 24 May 2012 at St George’s Chapel, Paphos, Cyprus, and their Wedding Reception and Evening Function were held at “Zaffron”. Although we both live in the Paphos area, and had booked St George’s Chapel, we were still trying to find the perfect reception venue. We had visited several places, but none of them were right for us. After searching on line we found Stella Verdi and we sent her an e-mail on a Sunday. Stella came right back to us and we arranged to meet at “Zaffron”, The warmth of her greeting put us both at ease, and as soon as we walked into Zaffron, we knew that it was just perfect for us. Despite the fact that we did all our own arranging of everything, Stella was always on hand for advice and direction, either in person, via e-mail, or via the phone. Thanks to her advice, we had the most wonderful photographer in Dimitri Katchis, and also Danny, who provided us with an exquisite video of the day, from getting ready at home to our first dance with all the background music being our own choice. Stella coordinated everything we wanted at the reception and evening function to absolute perfection, and after dealing with so many things ourselves, it was wonderful to have Stella there so that we did not have to worry about either. I had hand made all the wedding stationery, button holes, corsages, bouquet’s and table centers, and Stella took a great interest as to how everything was progressing, and it was wonderful to have her to discuss these things with and to “bounce off”. When Ian made our wedding cake, it was originally to be a two-tier, but then he decided to make it a three-tier, which was fine until I came to ice the three tiers and found that I only had enough icing for two tiers and I could not find anymore roll-out icing in Paphos! A phone call to Stella and we had the extra icing I needed. Nothing was too much trouble for her, no matter what our request. Stella was with us throughout our wedding day, from arriving with the photographers at my home, through to the first dance. Her interaction with our guests was perfect. She took some beautiful photos of her own, which she presented to us on a CD towards the end of our day, and it was wonderful to be able to see our first wedding photos on the day of our wedding in our honeymoon suite – such a beautiful record of our perfect day. Our reception at Zaffron was truly amazing. Budge, Stella’s husband, is the most exquisite chief, and our guests are still talking about the food at our reception. Not only was it perfect but also plentiful. We also had two guests who are vegetarian, and Stella made then individual meals herself, which our guests said were wonderful and huge! Everything was beautifully served and the service we received from Anne-Marie, Raj and Mario’s was superb. Our guests were also very taken with the delightful champagne cocktail they each received upon entering Zaffron – a “Stella Special” we understand. Living in Cyprus meant that in addition to our 40 wedding guests, we also had 20 additional evening guests join us, and Budge provided an evening buffet that was just incredible and very much appreciated by everyone. Despite the fact that Stella was not our official wedding coordinator/planner, she was always there for us no matter what we needed. 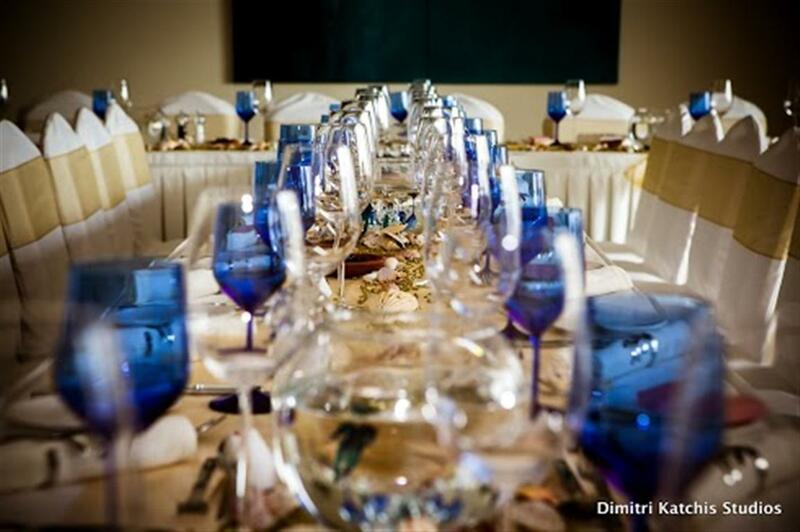 If you are looking to get married in Cyprus, and in need of a wedding coordinator/planner, who will ensure that absolutely everything is done the way you want it, who will deal with all legalities for you, who will be there for you no matter what you need, then you will not find another wedding coordinator/planner more perfect that Stella Verdi. If you are looking for the perfect wedding reception venue with exquisite food and service, and incredible ambiance both day and evening, then Zaffron is it. A friend came over in early October, and they were planning their wedding for September 2013 – in Turkey. After seeing our wedding photos, St George’s Chapel, meeting Stella and seeing Zaffron, the bride-to-be declared “I want your wedding!” “Zaffron” now has their date in their diary. Our wedding day was perfect in every possible way, and we can not thank Stella and Budge and their wonderful staff enough for ensuring that. Stella is aptly named – meaning “Star” – and she certainly lives up to her name. 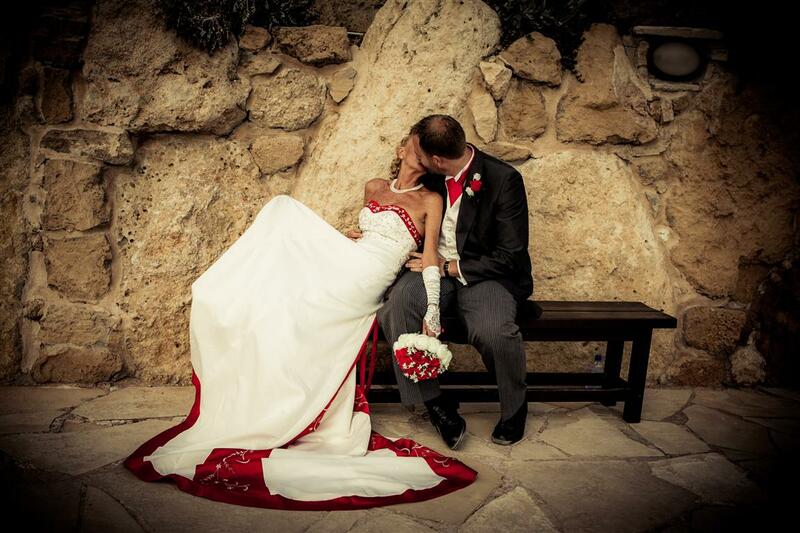 Your personal wedding planner here at Exclusive weddings – will provide a full service for couples who may need help from start to finish for their Paphos wedding. With help and advise all the way we will help alleviate the pressure and stress of organizing your wedding in Paphos, from a magical location, budget considerations, themes and decor. Stunning Bride of the Week. How beautiful did Angela look on her wedding day! Having a full day photography package is a great way not to miss a moment of you special day. From Bridal prep to sunset and first dance – each magic moment caught by our top-class photographer. That’s us back home settled into our cold wet country,missing Cyprus already.Just a thank you again for all your hard work going into our wedding day. Everything went as well as we would have wished for, the organisation the food the photos and the music were superb.Everyone one of our guests raved about how good the day went. Me and my wife would like to say a massive ‘thank you’ to Stella Virdi and her team! Stella Virdi was recommended to us by a family friend, and how glad are we that we listened to them. From the first phone call in England to arranging our taxi back to the airport Stella was impeccable. Any detail or worry however big or small is sorted with one phone call or email from England. 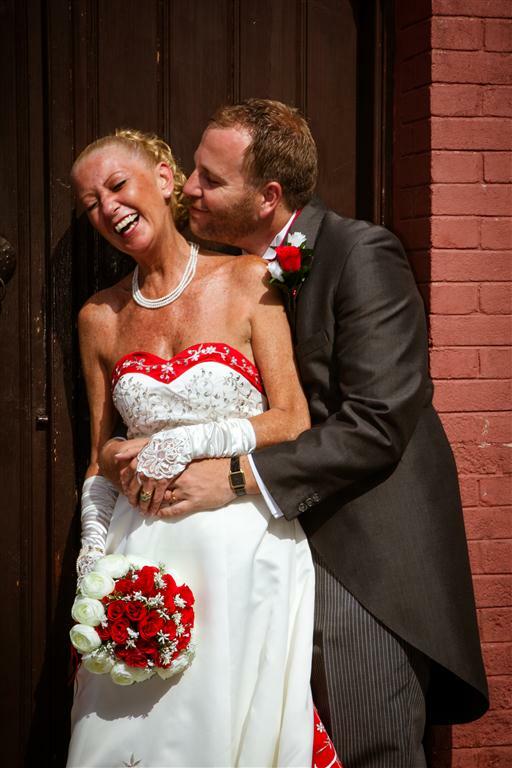 When arriving we were made to feel welcome and that our special day was in safe hands. Stella took us to sort out all of the paperwork which we would have been very stressful alone. Any minor detail we had forgotten was mentioned and arranged within minutes. We got married in St Paul’s Pillar and i don’t think we have seen a nicer little chapel to get married in. Then onto Elea Estates for the reception and you cannot put into words how beautiful this place is unless you have been. We had not visited this venue before going to sort out table plans etc and we were thrilled with it. This was all down to Stella putting together a wedding to meet our budget. We were unsure of having a DJ but Stella advised us that with 30 guests it was probably a good idea to have one and how right she was. We danced the night away after having the most wonderful harbor and sunset photo shoot with Stella’s recommended photographer Dimitris Katchis – all advised by Stella and we wouldn’t have changed it for the world. The flowers and cake were perfect along with DJ and photographer. The food and service from Elea Estates is out of this world. Stella was taking photos all day without being noticed and has presented these to us on a disc as a wedding present. She was brilliant with all of our guests especially the children. 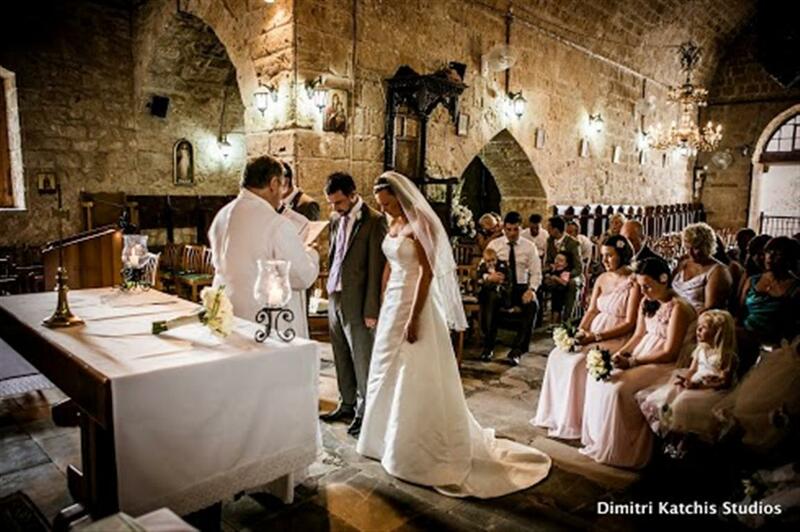 If you are getting married in Cyprus i strongly advise that you use Stella Virdi as your wedding planner! This was the best decision of our lives apart from marrying each other. We would like to say a massive thank you to Budge for an excellent meal the night before the wedding and an ever bigger thank you to Stella for what can only be described as a truly perfect day!!! See you in 2014 when my sister is using Stella to plan her wedding!